The Federal Reserve has addressed the financial market turmoil of the past two years in part by greatly expanding its balance sheet and by supplying an unprecedented volume of reserves to the banking system. Term deposits could be part of the Federal Reserve’s tool kit to drain reserves, if necessary, and thus support the implementation of monetary policy. There are other tools available to the Fed to remove liquidity from the economy, such as Open Market Committee operations, raising reserve ratios, and using reverse repurchase agreements. However, all of this begs the Big Question: When is the general level of prices going to start moving higher? 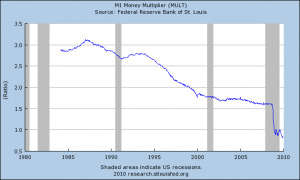 Two charts available from the Federal Reserve Bank of St. Louis illustrate the enormous rise in money supply (known as M1, below left) over the past year, as well as the “velocity” of money, known as the M1 Multiplier (below, right). 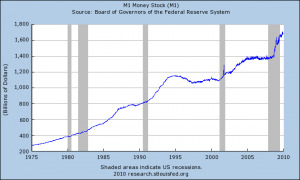 The decline in the velocity of money has essentially completely offset the growth in the money supply, reflecting consumers’ uncertainty about the economy, employment, and government intervention in the economy. If history is any guide, however, the consumer will soon see that price increases are inevitable, and will begin to spend their paper money before it loses more value. Harry Figgie and Gerald Swanson, in their book Bankruptcy 1995 did readers a service by illustrating graphically the behavior of prices in Bolivia, Argentina, and Brazil in the early 1980s. In each case, prices were relatively stable for a period of one to three years before taking off and reaching truly astronomical heights. The situation in Zimbabwe illustrates what happens as hyperinflation destroys the currency. There was a period of relative price stability lasting several years before the final blowoff. The Zimbabwean dollar was finally declared to be worthless in April. Marc Faber, editor of the Gloom Boom & Doom Report, was asked about the coming rise in price levels as a result of the Fed’s aggressive policies, and what impact that might have on the stock market. Ultimately, the Standard & Poor’s Index could rise 200% if the Fed prints enough money. I suppose this will happen over the next 10 years or so. Eventually, the U.S. government will have no other option but to print massively to finance the growing fiscal deficit. This entry was posted	on Monday, January 4th, 2010 at 4:14 pm	and is filed under Economics. You can follow any responses to this entry through the RSS 2.0 feed. You can leave a response, or trackback from your own site.